Authority to Prospect (ATP) 743 was granted to Comet Ridge Limited for a 12 year period, effective from 4 September 2009. The application was lodged on 18 March 2003 over vacant land. The initial work program period for ATP 743 was from 4 September 2009 to 3 September 2013. 675 sub-blocks were relinquished on the 3 September 2013. A special statutory 2 year extension of the initial work program was applied to ATP 743P. The initial approved work program was extended until 3 September 2015. 350 sub-blocks or 14 blocks were relinquished on 3 September 2015. A later work program (LWP) was submitted to the DNRM on 7 July 2015 as part of the requirements for the continuing approval of ATP 743. The LWP for ATP 743 was approved on 16 December 2015 for the period 1 November 2015 to 3 September 2019. Authority to Prospect (ATP) 744 was granted for a 12 year period, effective from 1 November 2009. The application was lodged on 18 March 2003 over vacant land. The initial work program period for ATP 744 was from 1 November 2009 to 31 October 2013. 700 sub-blocks or 28 blocks were relinquished on 31 October 2013. A later work program (LWP) was submitted to the DNRM on 16 August 2013 as part of the requirements for the continuing approval of ATP 744. The LWP for ATP 744 was approved on 22 April 2014 for the period 1 November 2013 to 31 October 2017. A special statutory 2 year extension of the later work program and relinquishment conditions has been applied to ATP 744. The current approved work program and relinquishment condition has been extended until 31 October 2019. 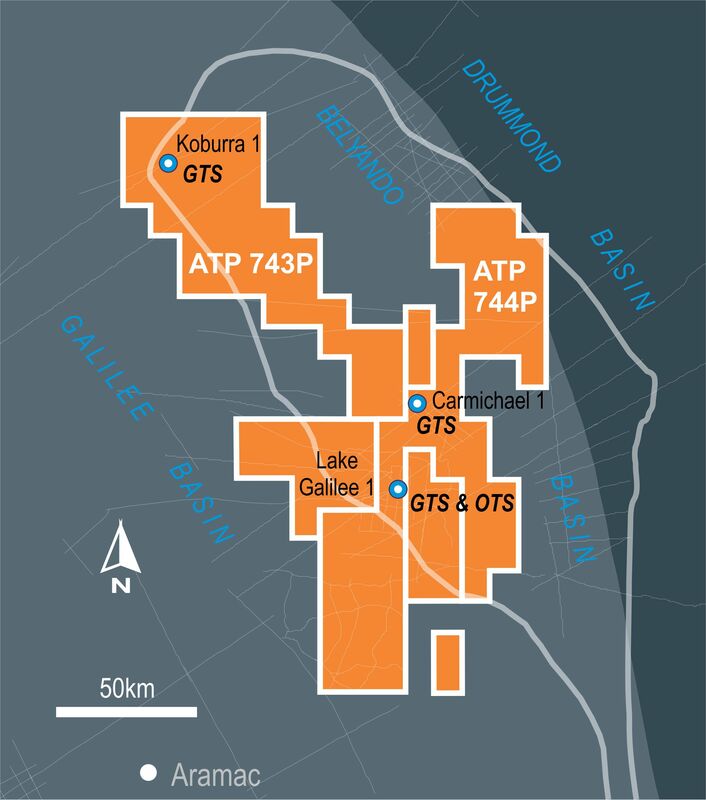 In July 2012, Comet Ridge announced that it had signed a three-stage farm-in agreement with Queensland Energy Resources Pty Limited (QER) to earn up to 75% of a farm-in area, located in the south east of permit ATP 1015, adjacent to the Company’s 100% held Gunn Project Area in ATP 744. The farm-in area consisted of two separate blocks totalling approximately 825 km2. Comet Ridge was exploration operator of the farm-in area and as part of the farm-in agreement, drilled 2 wells Schmitt-1 and Cernan-1, in 2012 to complete the first stage of the farm-in agreement. In mid-2014, Comet Ridge drilled a third well, Harrington-1 in the farm-in area as part of Stage 2 of the agreement. In the third quarter of 2016, Comet Ridge entered into an agreement with Queensland Energy Resources (QER) to acquire all of its interest in ATP 1015. The transfer of the full interest in ATP 1015 from QER Limited to Comet Ridge Galilee Pty Ltd was approved and registered by the Department of Natural Resources and Mines in Q3 2017. With this transfer, Comet Ridge became the 100% equity holder of the ATP. The initial work program period for ATP1015 was 1 December 2010 to 30 November 2014. A special statutory 2 year extension of the later work program and relinquishment conditions has been applied to ATP 1015. The initial approved work program and relinquishment condition was extended until 30 November 2016. 150 sub-blocks or 6 blocks or were voluntarily relinquished on 21 June 2016. 450 sub-blocks or 18 blocks were relinquished on 30 November 2016 as part of the statutory relinquishment requirement. A later work program (LWP) was submitted to the DNRM on 31 August 2016 as part of the requirements for the continuing approval of ATP 743. The LWP for ATP 743 was approved on 25 October 2016 for the period 1 December 2016 to 3 September 2019. On 1 November 2017, Comet Ridge announced that an agreement to farm-out the sandstone reservoir sequence of ATP 744, ATP 743 & ATP 1015 was executed with Vintage Energy Limited. Stage 1 of the agreement to farm-in is divided into steps. 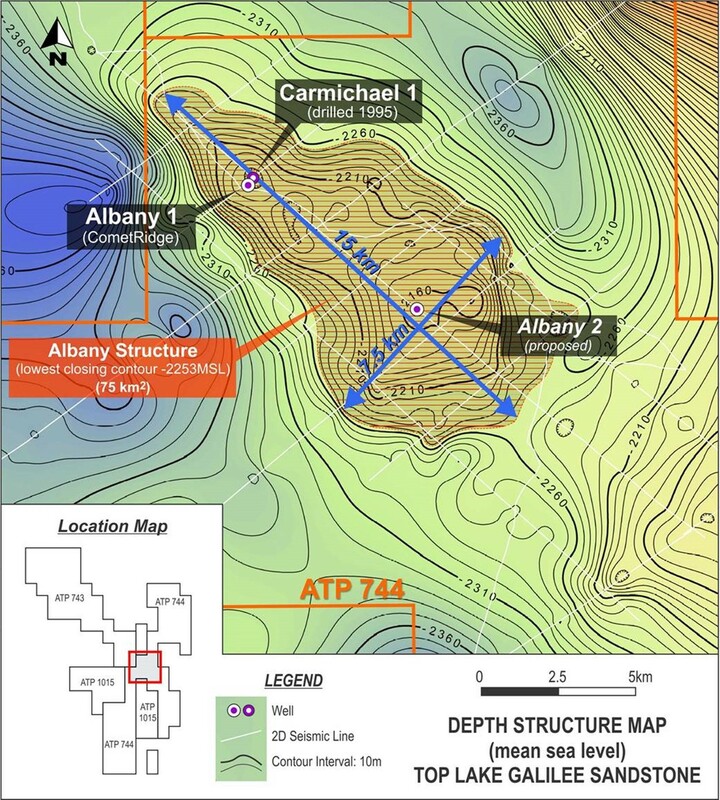 Stage 1a requires the drilling and post well production testing of one conventional gas appraisal well on the Albany sandstone structure, close to where the Carmichael 1 well flowed gas in 1995. Vintage will fund the first $3.35 million of the Stage 1a expenditure to earn a 15% interest in the Deeps across the three Galilee Permits. The total cost of Albany 1 and the associated production testing has been estimated to be approximately $3.5 to $3.8 million and each party will pay its proportional share. (15%/85%) of the difference between the $3.35 million cap and the actual well drilling and testing costs. Stage 1b is the provision for well stimulation and subsequent production testing of the Albany 1 well. The decision to proceed with this stage will be determined by the gas flow rate of the Albany well once completed. The cost of this stage has been estimated at $1.2 million. If Vintage Energy and Comet Ridge both agree to proceed with Stage 1b the cost will be shared on a 25% (Vintage) and 75% (Comet) basis. 2 If Comet elects not to participate in this stage, but Vintage decides to do so, it may carry out the stage at its sole cost which will entitle it to a further 3.5% interest in the Deeps bringing its total interest to 18.5%. Stage 2 of the agreement to farm-in requires each party to spend up to $5 million each (for a $10 million total programme) for Vintage Energy to earn a further 15% equity to go to 30%. Stage 2 of the Farm-in work programme includes further drilling on the Albany structure, focussing on increasing resources and reserves beyond what was achieved on the first well. Approximately half the Stage 2 funding would also be allocated towards 2D and 3D seismic acquisition to define further drilling targets in the many other sandstone targets across the Galilee Permits. Participation in Stage 2 by each party to the agreement to farm-in will be at the election of each party and most likely dependent upon each of the parties’ assessment of the results of the Stage 1 drilling programme. if both parties elect to proceed and contribute the expected $5 million each, Vintage Energy will earn another 15% in the Deeps increasing its total holding to 30% (or 33.5% if it carried out Stage 1b itself). The total cost of Stage 2 is expected to be $10 million. Each party will contribute equally to this cost. Any expenditure over the estimated cost will be borne by the respective parties in the interests that they would otherwise hold at the end of Stage 2. If Comet Ridge elects not to participate in Stage 2, Vintage Energy may elect to proceed and fund 100% of the Stage 2 work program. In exchange for funding the whole of the $10 million, Vintage Energy will be entitled to an extra 15% interest in the permits meaning that subject to it having completed Stage 1b on its own, shall earn up to 48.5% in the Galilee Permits. Prior to the granting of ATP 744 and ATP 743 there had been little exploration for CSG across the Galilee Basin. CSG evaluation carried out by Enron in the central part of the basin in the early 1990’s consistently encountered coal intersections of 25 to 35m. Gas indications recorded over coal seam intervals confirmed the presence of gas associated with the coal seams. The focus of the initial work program for ATP 744 and ATP743 was to evaluate the CSG potential of the Permian Betts Creek beds in the Galilee Basin. Comet Ridge commenced a five-well exploration programme from late 2009 to mid-2010 to evaluate the CSG potential of the Betts Creek beds across the two tenement areas. Skiff 1 was drilled in the north-western portion of ATP 743. Montani-1, Shoemaker-1, Hergenrother-1 and Gunn-1 were all drilled within ATP 744. All wells were fully cored through the Betts Creek beds to determine key coal properties. The most promising results were seen at Hergenrother-1 and Gunn-1 in the south west of ATP 744 where net coals of approximately 16m thickness were intercepted. Gas content, permeability and gas saturation were most encouraging leading to the definition of the Gunn Project Area over the south western leg of ATP 744. The exploration program then focussed on evaluating and delineating CSG resources and has identified the Gunn Project Area. 255km of 2D land seismic was acquired over the area in mid-2011 to better understand the performance of Gunn-1 and Hergenrother-1 and improve understanding of the structure in the area. Comet Ridge commenced a three-well exploration and appraisal drilling programme in late 2012. The first well, Gunn-2 was drilled to further appraise the coal seams near the offset well, Gunn-1 in ATP 744 and the following two wells in the farm-in area, part of ATP 1015. The first well, Gunn 2, reached a total depth of 1,050 metres and intersected 16.2 metres of net coal in the Betts Creek beds. Wireline conveyed testing tools were used to flow test four separate coal intervals in the Betts Creek beds, including two coal intervals in the base of the section that had not been previously tested in the Gunn Project Area. All four coal intervals demonstrated good to excellent productivity. The Schmitt 1 and Cernan 1 are both located in ATP 1015 to the east of the Gunn Project area and were designed to further appraise the Betts Creek beds. Both wells were fully cored through the Betts Creek beds and intersected 22m and 20.5m of net coal, respectively. 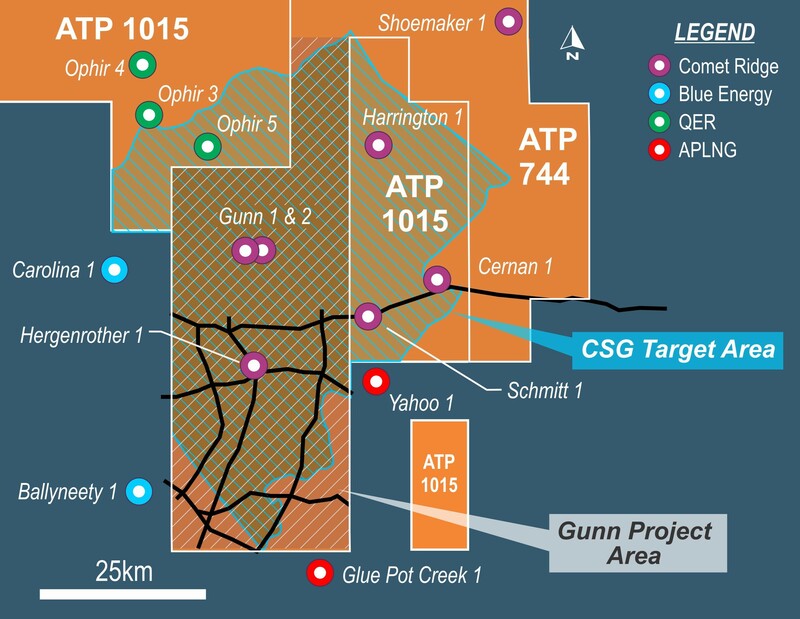 These wells have confirmed the extension of the Gunn Project Area to the east into ATP 1015. Analysis of the data indicates coal seam gas target area (Gunn Project Area & part of ATP 1015) in contain recoverable gas, over an estimated area of approximately 1,865 km2. An extended production test was completed on Gunn 2 well in early 2013. Comet Ridge commenced the drilling of the Harrington 1 appraisal well in May 2014 in the northern part of ATP 1015. The Harrington 1 well reached a total depth (TD) of 1042 m and was cored through the entire Betts Creek beds, intersecting approximately 19 m of net coal. Harrington 1 well continues to demonstrate that coals extend consistently over a wide part of the eastern Galilee Basin. In parallel with the drilling programme, the Gunn 2 well was completed for production in November 2012, with tubing and a downhole pump installed to enable water to be produced. During December 2012, surface facilities including water storage tanks, flowlines, metering facilities and power generation were installed on site and in early January 2013, these facilities were commissioned for operation. The objective of the EPT was to obtain water quality data and establish connectivity with the coals to enable critical assessment of the completion methodology providing key design inputs for a pilot scheme. The well was perforated over a four metre interval from 952.5 to 956.5 metres which is bounded above and below by impermeable mudstone. The EPT was designed in this manner to ensure water would only be produced from the Betts Creek reservoir coal. By excluding water from other zones in the well, surface water handling requirements could be optimised and dewatering time could also be minimised. The pump and other equipment performed as designed with no mechanical or electrical issues throughout the test. The water rate was progressively increased over a period of a few weeks, with the well reaching a stabilised production rate of approximately 400 bwpd (barrels of water per day) which is the limit of the pumping system under the current configuration. Analysis of the pressure data showed that the four metre coal interval, which was the subject of the test, has even greater flow capacity. Formation water samples from the coal were taken at regular intervals for very detailed laboratory analysis. The progress of the EPT has been extremely pleasing, with this well an important milestone for the Company in the Galilee Basin. This is the first test for the Company on a completed well, where the well has been set up for long term production. Another very important outcome from the EPT is that the simple completion style of the well (case, cement and perforate) has proved to be extremely effective in both connecting the wellbore to the fractures in the coal and also in isolating the coal from sandstones. This simple design can subsequently be applied to a pilot scheme to access selected coals. The Company is now evaluating different methods of water treatment. This trial will aid in forming the basis of design for a pilot scheme in the Gunn Project Area with the intention of achieving independently certified gas reserves, which would be available for power generation, LNG manufacture or domestic gas markets. The highly successful Gunn 2 Extended Production Test (EPT), which flowed at 400 bwpd (barrels of water per day) led to the submission of a formal Underground Water Impact Report (UWIR) to the Department of Environment and Heritage Protection (DEHP), as required by legislation under the Water Act 2000 (Qld). This report was concluded during the December quarter and released for public review and comment in early January 2014. The report concluded that the Betts Creek Coal reservoir is isolated from shallow aquifers that are used for local stock watering, and due to the impermeable nature of the 300 m thick Rewan Formation between the shallow aquifers and the Betts Creek Coals, no impact will be seen in the shallow aquifer units. The Water Act requires that if there were any impacts, the Company would need to “make good” any impact on local farmers through drilling of new water bores, provision of CSG produced water, or other means. All landowners in the project area were formally notified by letter, and notices placed in a local newspaper, as required by law. In addition, a series of one-on-one meetings were conducted between the Company and landowners to explain the formal process required by law, and to run through the conclusions of the study that was conducted and the content of the UWIR. The UWIR was reviewed in early 2017, as part of a statutory requirement to review the UWIR every 3 years. The UWIR was re-submitted to DEHP using existing conditions (no additional work was conducted during the initial year period) for approval after a community consultation period. THE UWIR was approved by DEHP on 21 July 2017 and remains current until 20 July 2020. Significant gas potential outside of coal seams exists within the deeper section, yet to be drilled and tested by Comet Ridge. Historically, conventional petroleum exploration within the Galilee Basin has been primarily focussed on conventional oil targets. The most prospective areas of hydrocarbon potential include the Koburra Trough and Lovelle Depression. Exploration drilling and seismic coverage across the basin has been sparse and too date no commercial hydrocarbon discoveries have been made. Hydrocarbon shows have been recorded over the throughout the Galilee Basin sequence with the most promising results from the Lake Galilee Sandstone in the Koburra Trough in the eastern part of the basin. Gas to surface has been recorded from three wells and oil recovered from one well from the Lake Galilee Sandstone within the Koburra Trough. Three historical conventional petroleum exploration wells (Koburra 1, Lake Galilee 1 & Carmichael 1) were previously drilled within ATP 744 and ATP 743 to test conventional oil targets defined by sparse regional seismic coverage. Hydrocarbon shows and gas indications are common throughout the Galilee Basin succession. While minor gas shows were recorded over sandstone and shale units over the Triassic sequence, gas indications over sandstone and coal intervals within the Late Permian Betts Creek beds confirm coal seam gas potential of the in the region. The most prospective sequence for conventional hydrocarbons is the Late Carboniferous to Early Permian where consistent gas shows and indications have been recorded over sandstone intervals within the Jochmus Formation, Jericho Formation and Lake Galilee Sandstone. 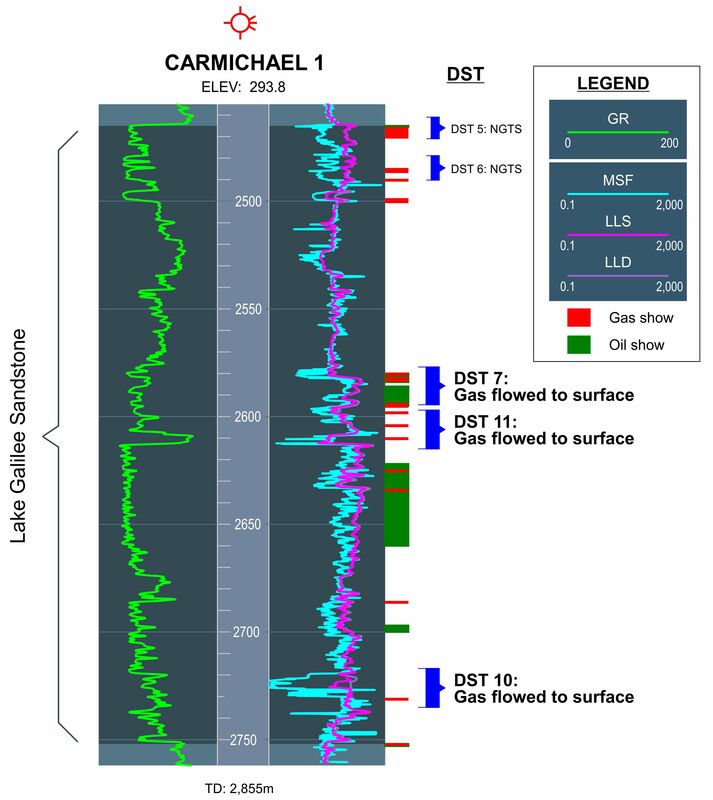 Oil and gas shows have been recorded over sandstone intervals of the Jericho Formation in Carmichael 1 and Lake Galilee 1. Gas indications up to C4 were recorded within sandstones of the Jericho Formation in Carmichael 1. No oil or gas was recovered from the formation and tests were disappointing and indicate the sandstones are tight. In Carmichael 1, an excess of 167m of notable permeable sandstones occur over several intervals between 1037.5 and 1441.1m in the Jochmus Formation and 1958.8 and 1962.3m in the Jericho Formation. No DSTs were run over these intervals. The source of the hydrocarbons is thought to be in the section below deeper than the Galilee Basin, which are likely marine rocks within the basal part of the Drummond Basin sequence or Devonian aged marine rocks postulated to underlie the Drummond Basin sequence. These drilling results provide evidence of an active petroleum system present over the Koburra Trough. However, to date no reservoirs have been intersected of a quality suitable to flow commercial quantities of gas, even though gas flows at low rates have been observed two decades ago when the focus was on oil exploration. Carmichael-1 well was drilled in 1995 by Maple Oil & Exploration NL, as an oil exploration well, to test the petroleum potential of the Late Carboniferous Lake Galilee Sandstone over a robust seismically defined anticlinal structure in the then ATP 588P (now ATP 744). The structure is approximately 15km long on its main axis. Three separate zones within the Lake Galilee Sandstone flowed gas to surface at low rates. An additional significant section of gas pay was not tested. The well discovered a large natural gas accumulation which was deemed uneconomic at the time based on drill stem test results, and historic very low gas prices, and the well was plugged and abandoned. 2015 reprocessing and reinterpretation of the seismic data over the Albany Structure confirmed the presence of a large anticlinal structure with a significantly larger structural closure than had been previously mapped. A review of the well data and results has been used to quantify key reservoir parameters. The well results also indicated that the productivity of the tight gas formation was not optimally tested in Carmichael-1 due to the significant overbalance in mud weight and the presence of liquid hydrocarbons decreasing relative permeability to gas. 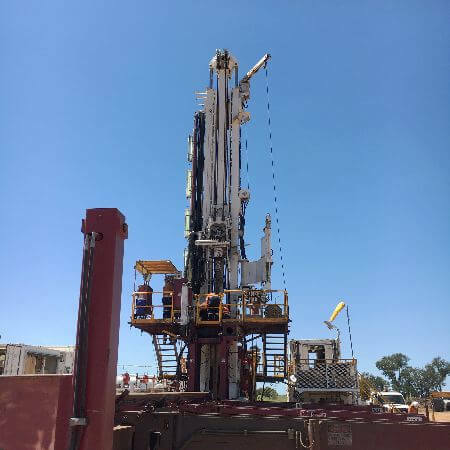 Air/nitrogen drilling technology has been used in several conventional gas fields (Rolleston, Yandina, Myall Creek) in Queensland where formations are fluid sensitive and susceptible to formation damage from mud overpressure to minimise reservoir damage. Results from air/nitrogen drilling in these areas significantly improved production rates and commerciality of the fields. The recent prospect review led to an initial independently certified Contingent Resource Booking for the Albany Structure of 56PJ 1C, 153PJ 2C and 417PJ 3C, on 5 August 2015. The certification follows an independent review of the Albany Structure by the certifier SRK Consulting (Australasia) Pty Ltd. A far as the company is aware this is the first sandstone gas resource booking in the Galilee Basin and is an important result for Comet Ridge. Details of the resource certification are provided in the table below. 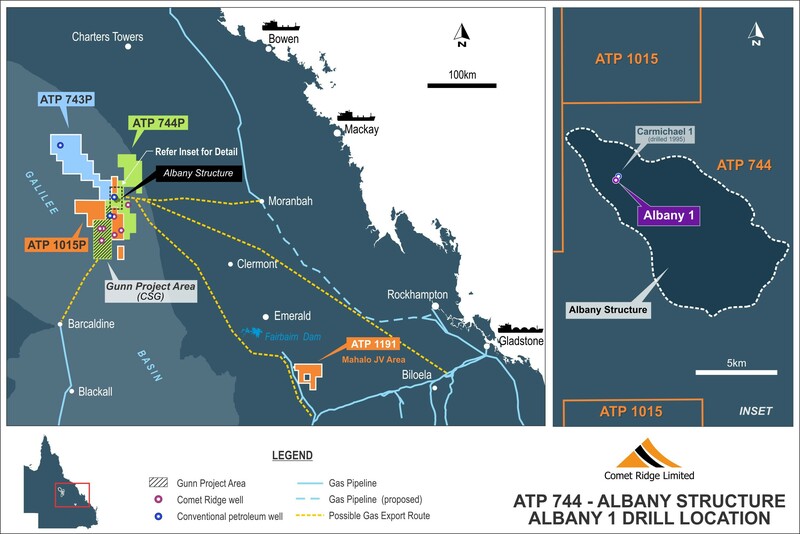 In Q2-Q3 2018, the company drilled Albany-1, a twin the Carmichael-1 on the Albany Structure as part of Stage 1a farm-out agreement with Vintage Energy Limited. Albany-1 was designed as an appraisal well to re-evaluate the gas flow potential of the Lake Galilee Sandstone as encountered in previous conventional exploration wells in the tenure area. The primary objective was to flow gas from interpreted reservoir intervals over the Lake Galilee Sandstone. Albany-1 was conventionally drilled to the top of the Lake Galilee Sandstone and then air/nitrogen drilled through the reservoir interval to a proposed TD. While drilling through the Lake Galilee Sandstone reservoir, a recorded stabilised gas flowrate of 230,000 scf/d was measured from a 13m interval from 2582 to 2595m during a flow test. The flow of gas was continuously flared for approximately 24 hours (before being terminated for a planned short build up test) with the gas glow for the last hour of the flow test being diverted through an orifice metering system for accurate measurement. No water production was observed and no decline in gas flow was observed throughout the duration of the test. The JV believes this is the first measurable flow of natural gas from the Lake Galilee Sandstone in the Galilee Basin. Due to technical difficulties the well did not reach the proposed TD of 2780m and was suspended for completion at a later date at a TD of 2595m. Given the successful flow result of Albany-1, the JV is planning operations to complete the drilling of Albany-1 along with a location of the step-out well, Albany-2, which is part of Stage 2 of the Vintage Energy farm-in. The joint venture is also in the early stages of planning a seismic acquisition program to further evaluate other sandstone leads and prospects across the southern part of the farm-in area. Further potential exists within source rocks that have generated the hydrocarbons intersected within the Galilee Basin. The source of the hydrocarbons is likely to have been generated from marine rocks within the basal part of the Drummond Basin sequence or Devonian aged marine rocks postulated to underlie the Drummond Basin sequence in the Koburra Trough. This sequence has not been targeted or intersected by exploration drilling to date. In late 2010, Comet Ridge announced that Netherland Sewell and Associates (NSAI) had completed an independent resource certification for the Gunn Project area in ATP 744. 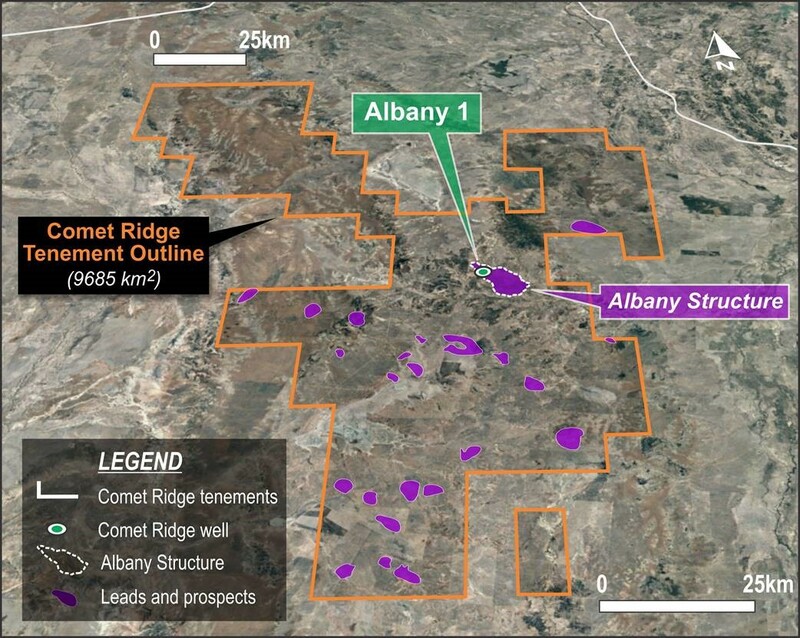 In August 2015, Comet Ridge announced that SRK Consulting (Australasia) Pty Ltd had completed an independent resource certification of the Albany Structure in ATP 744. Note: Gas Reserve and Resource numbers have been rounded to the nearest whole number. *ASX Listing Rule 5.28.2 Statement relating to Prospective Resources: The estimated quantities of petroleum that may potentially be recovered by the application of a future development project(s) relate to undiscovered accumulations. These estimates have both an associated risk of discovery and a risk of development. Further exploration appraisal and evaluation is required to determine the existence of a significant quantity of potentially moveable hydrocarbons. **Where the auditor has detailed Prospective Resources in a range, the mid-range case has been listed in the table.